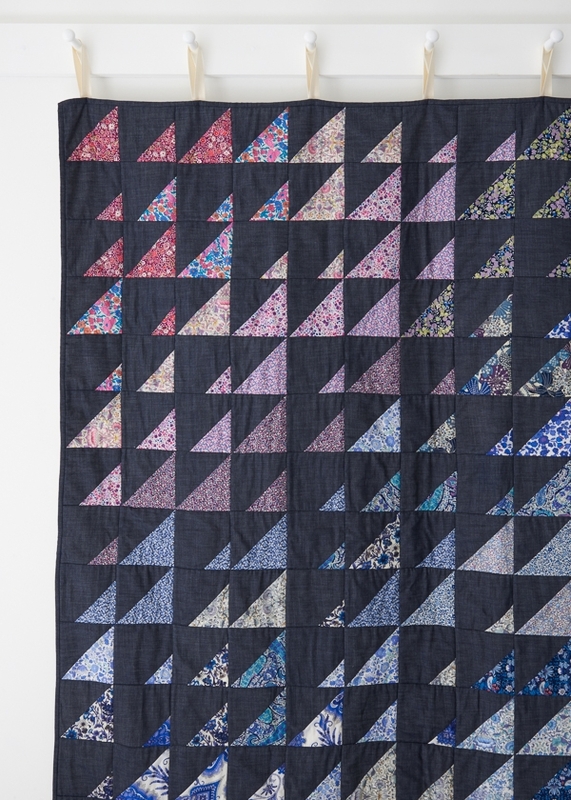 I am a huge fan of Liberty of London’s iconic Tana Lawn prints, which is why our Prism Quilt in Liberty of London is especially dear to my heart. 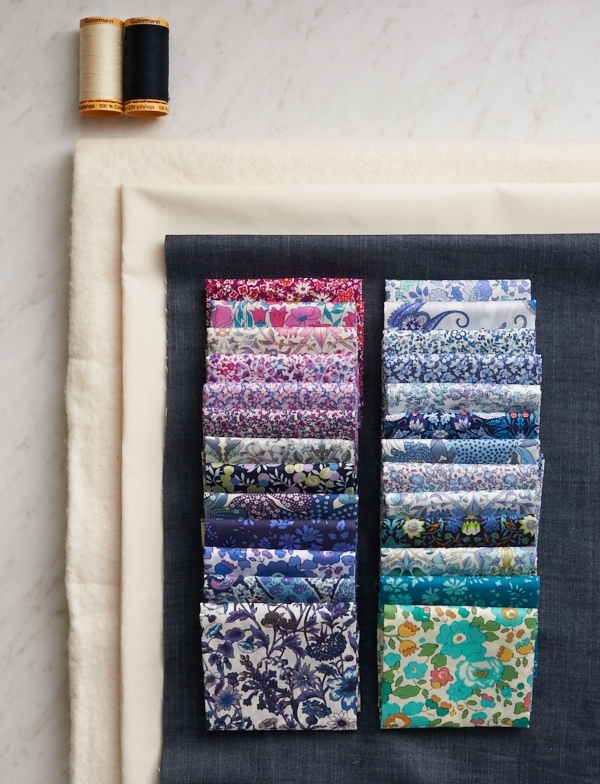 It’s amazing to see so many of these gorgeous fabrics together in one pretty place! 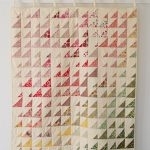 Our original Prism Quilt used a Liberty Half Rainbow Bundle in a Warm palette ranging from pale pink to rich green. I love the original quilt’s sunny, cheerful look, but as soon as I finished it, I knew I needed to see it in the Cool colorway as well! 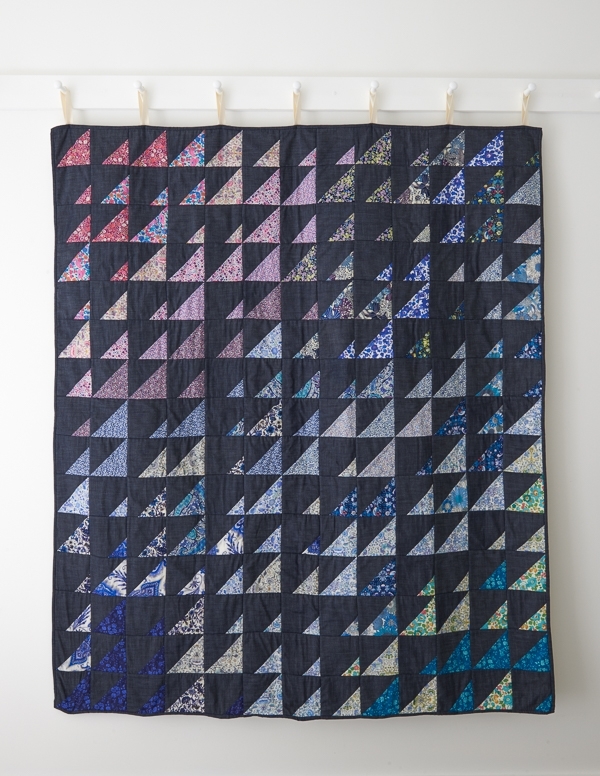 This new version explores a chillier palette by using a Cool Liberty Half Rainbow Bundle and pairing it with Robert Kaufman’s Draper Denim Indigo. The prints, which run from deep purple to bright turquoise, seem to glow against this rich backdrop of dark denim. For the free pattern, please visit our original story. I’ve purchased several of your denims recently. 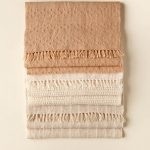 Do you think I can use any of them as a substitute and not worry about color transfer or “hand” of the quilt? I think you can probably use them, unless they are a very heavyweight. Just make sure to pre-wash them all! I have made two of this pattern and just love it. I made it in light and bright colours and patterns but now I am going to make it in the darker colours. 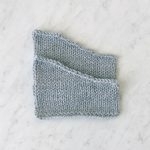 Thank you for the inspiring free patterns. 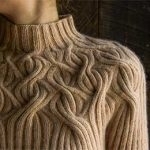 I would like to make this free pattern but when I click on the original story for the pattern nothing happens. Thanks for writing in! I am happy to try to help The order of the Liberty prints can be seen in the first picture under the Materials section. Swatch 1 appears at the left top and you will move down the left column and then from top to bottom on the right column. As far as the lay out, that is up to your preference! I would suggest sketching everything out using a pencil and colored pencils to get an idea of how you would like to lay it out as close to our layout on the original size. As we have not made a larger version, there is no prescribed way but whatever you come up with will come out lovely! Love this quilt! 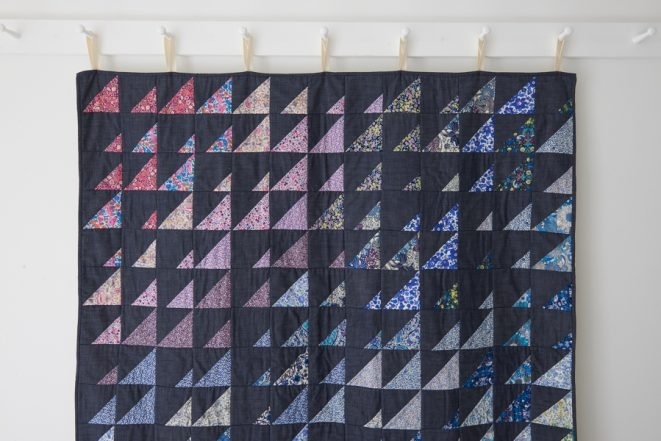 Is there enough fabric in the liberty half rainbow bundle to make 2 quilts of the same size? Would like to make a quilt for each of my boys. Thanks for writing in! 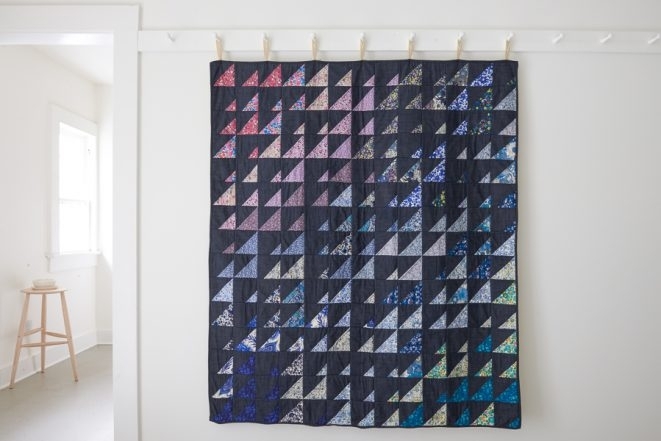 The half rainbow bundle will give you enough fabric to make 2 of these lovely quilts! I love this. 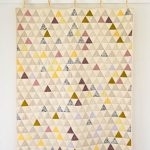 You could just go willy nilly and playfully add any size triangle to the background fabric. Fun! Thanks for writing in! Due to discontinued prints and colors, we do have to occasionally substitute or shift placement of fabrics in our Liberty bundles, though we always try to select available prints that maintain the spirit and beauty of the original bundle! If you would like to add a few more prints to expand the palette, you could supplement the Liberty Half Rainbow Bundle with the reds and turquoises in our Liberty Mini Rainbow Bundle. A few of the prints are in both bundles, but some are exclusive to the Mini Rainbow Bundle so you will have plenty of options for future projects as well! Draper Denim Indigo as well and cannot– is there a substitute you would recommend? thank you! Thanks for writing in, and I’m so sorry the Draper Denim Indigo is out of stock! 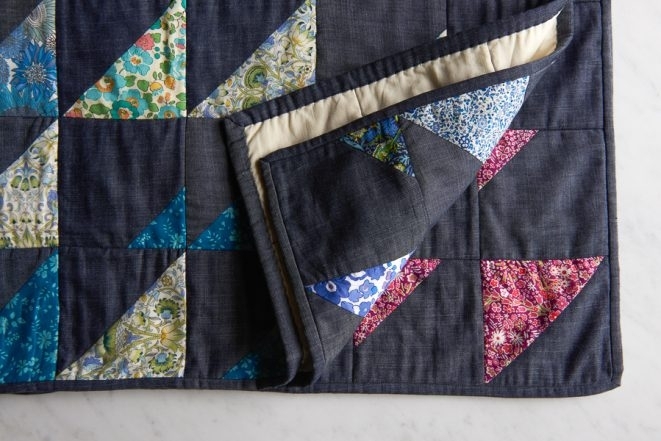 You can enter your email address on the product page to be notified when we have it back in stock, but if you would like to get started right away, I think Robert Kaufman Chambray Union in Denim Indigo 14119-62 would be an excellent substitute – I myself used it along with several Liberty prints for a quilt and they look lovely together! 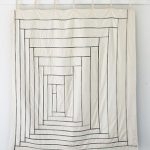 I made this quilt last year using the muslin. I’d like to use a denim chambray like you’ve used. I’m intrigued by the Kaufman double gauze chambray. I’ve never seen double gauze in person so I’m curious how it might pair with the lawn on this pattern. What are your thoughts? 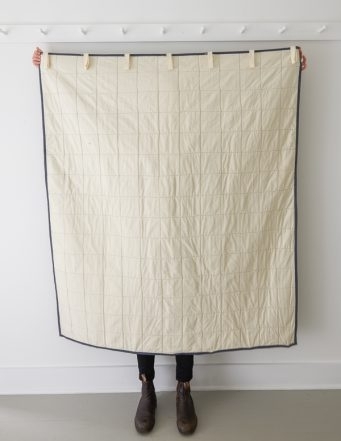 Would it work for this quilt? Thank you! Thanks for reaching out! 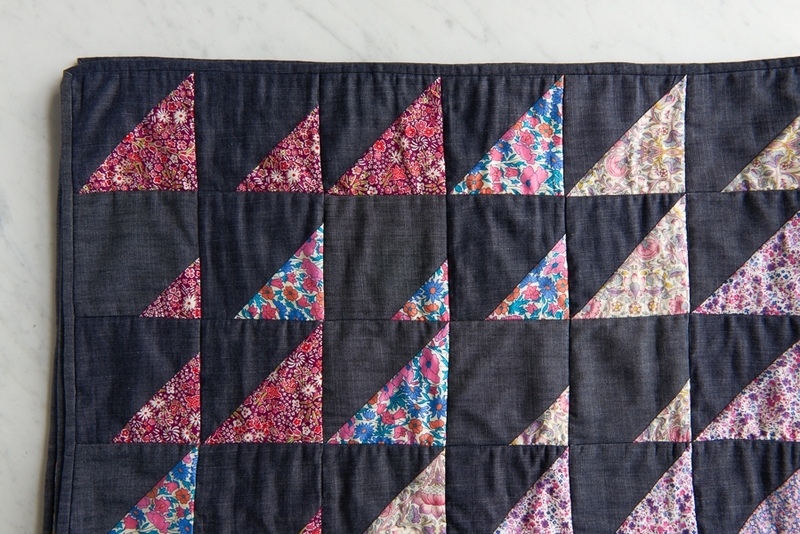 Double gauze is a wonderful alternative quilting fabric as it adds a bit of textural interest. 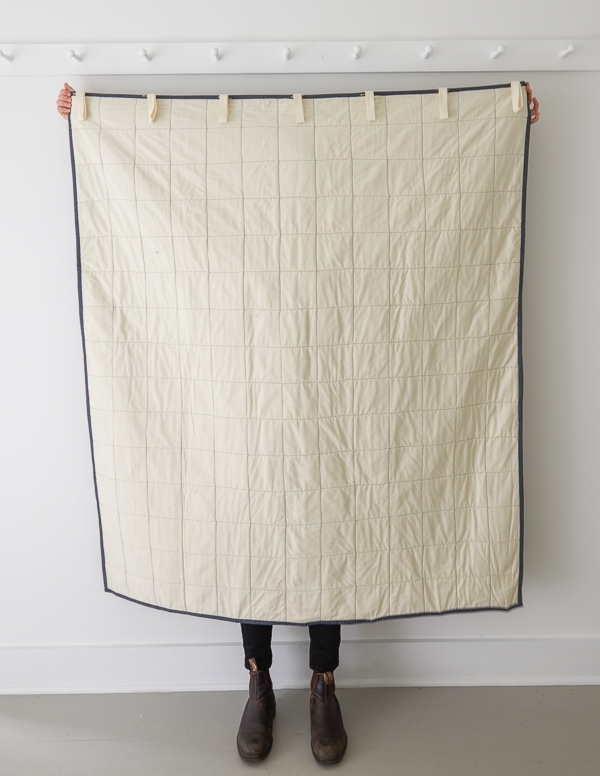 Our Tiny Tile Quilt is a great example as it uses double gauze, light weight cottons and muslin together to create a lovely effect! I would suggest prewashing all your fabrics, since double gauze shrinks at a different rate than cotton lawn.